A morning whiskey "mouthwash," a bottle of champagne at lunch, drink-offs with President Roosevelt. All in a day's work for U.K. Prime Minister Winston Churchill. Fox Photos/Getty ImagesWinston Churchill at a luncheon with the Lord Mayor at the Mansion House in the City of London. Winston’s Churchill’s achievements as prime minister of the U.K are hard to match. If you think about what you’ve accomplished versus what Churchill had, you may find yourself in a hole of despair. You may just want to reach for that bottle of beer or glass of whiskey to numb you from your lack of accomplishments. Unfortunately, in doing so you’ll only be furthering those feelings of inferiority. You see, Winston Churchill was also a boozer, a sot, a lover of alcohol and he could definitely outdrink you. Churchill’s affinity for drinking dated back to when he was a 25-year-old correspondent covering the Boer War for the Morning Post in 1899. When he was sent out to the front line, he took 36 bottles of wine, 18 bottles of aged scotch, and six bottles of vintage brandy with him. His cabinets were always stocked with whiskey, claret, and port. 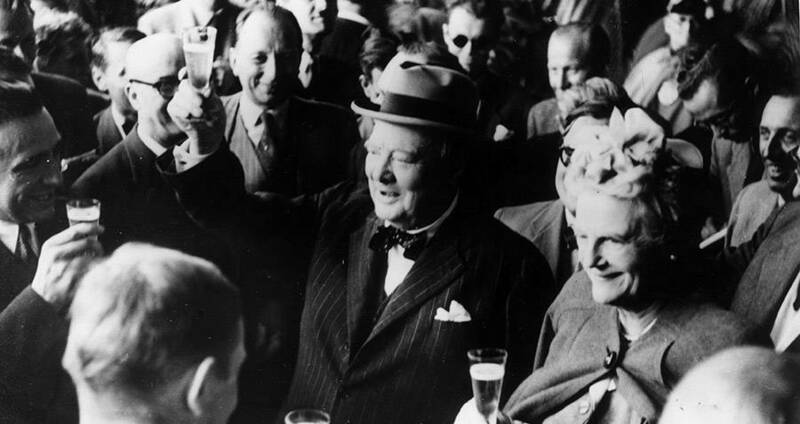 In 1936, Churchill reportedly had a tab with his wine merchant that was today’s equivalent of $75,000 today. 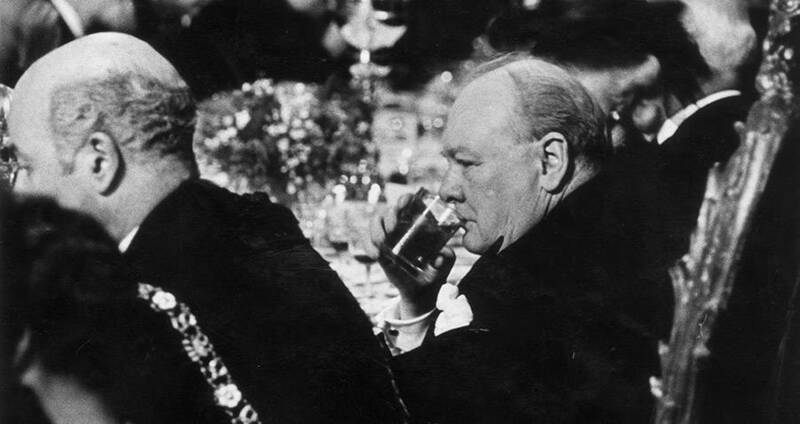 When he became prime minister in 1940, Churchill refused to moderate his drinking. He admitted that he had a reliance on alcohol, but made no attempts to quit. Lunch and dinner were accompanied by brandy and champagne, and he always had a glass of whiskey by his side. Getty ImagesFormer British prime minister Winston Leonard Spencer Churchill (1874 – 1965) and his wife Clementine make a toast upon their arrival in Switzerland. It’s hard to pin down exactly how much Churchill drank. One estimate placed his consumption of Pol Roger champagne at 42,000 bottles during his lifetime. The truth blurred with rumors in regards to the extent of his excess. It was Churchill’s impression that Europeans appreciated a leader who could hold his liquor, so he did little to quell the rumors anyway. According to Churchill’s private secretary Jock Colville, he’d kick off his day with a “daily whiskey mouthwash.” From there, once the drinking started, it rolled on. Giving great speeches was one of Churchill’s most notable traits. His speech “Blood, Toil, Tears, and Sweat” was his first speech as prime minister. His “We Shall Fight on the Beaches” speech at Dunkirk is lamented for its inspiring message. But Churchill’s stirring oratory wasn’t limited to moments of major historical significance. He had a natural wit. Not one to let his drinking get in the way of his quick tongue, Churchill’s intoxication actually enhanced his ability at times. One of the most notable anecdotes is a story that revolves around a woman accusing Churchill of being – what else – hammered. The woman in question is unclear, but some believe it was the Conservative Lady Astor. Whether you choose to take the story as truth or myth, there’s ample evidence showing that Sir Winston Churchill – the British Bulldog, the prolific writer, the famed politician – was also a bit of a boozehound. If you liked reading this story, you might also want to check out these presidents who liked to party. Then, check out these 25 shocking and inspiring Winston Churchill quotes. North Korea's Ryugyong Hotel – The "Hotel Of Doom"